The Big EDUAD Timesulin Giveaway! I know... I know... You wait weeks for a post then three come along all at once! Those of you with memories as bad as mine will doubtless have forgotten that I wrote some time ago about Timesulin, an ingenious replacement insulin pen cap. 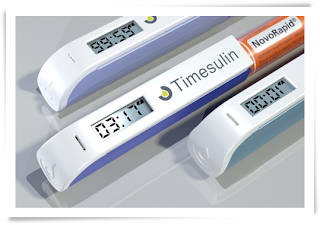 While not a fully equipped dose memory device the Timesulin is brilliant in that it does solve the main challenge of "Did I take my insulin just now or not?". There are different versions to fit the pens for most popular UK insulins and the device works by displaying how long it has been since the last dose was taken. A quick glance will tell you whether it was 5 minutes or 4 hours and Hey Presto! No more missed-dose vs double-dose conundrums. Cleverly the device does not need to you interact with it in order to register the injection, it 'knows' when you take the lid off the pen. And even more clever, it allows you to take a quick peek at how much insulin is still in the cartridge without registering that as a dose. Which is a great touch and kinda lets you know that at least some of the people who developed it have T1 themselves. The lovely folks at Timesulin have offered us three, yes THREE! Timesulin caps to you, dear readers. If you would like a chance of winning one, please just send your name by the end of January to mike[at]everydayupsanddowns.co.uk or leave a comment below. I'll put all the names in a hat and draw the three lucky winners on 1st February 2014, then Timesulin will send you whichever cap suits your insulin free of charge. I absolutely love, love, *love* the DOC. Just a quick glance at Twitter and I can be cheered, encouraged, supported, made to laugh and occasionally brought to tears all at once. Other times you go looking for some lightweight wit and wisdom, or just to see what folks are up to and suddenly discover some weighty new piece of research, campaign to fight for or better still... everyone's favourite diabetes benefit an exciting-sounding new gadget. 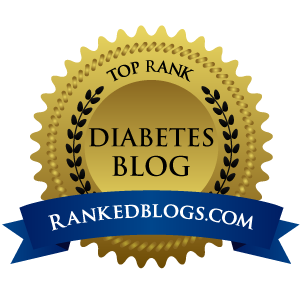 Before Artoo became my constant companion a couple of years ago, I wrote quite a few posts about Lantus basal insulin. I spent quite a bit of time trying to wrestle Lantus into submission, and eventually we got to the stage where we muddled along bearably, but it's fair to say that one of my main motivators for starting pump therapy was to get 'proper' basal coverage, that accurately reflected the ebb and flow of my body's rhythms over a 24 hour period. 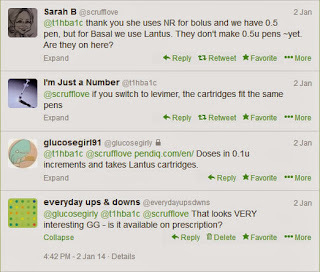 Comparing notes with other users it seems I was not the only person to be frustrated by Sanofi's rather less than enthusiastic approach to insulin delivery. Most of the injection pens that fitted Lantus were, frankly, nasty. 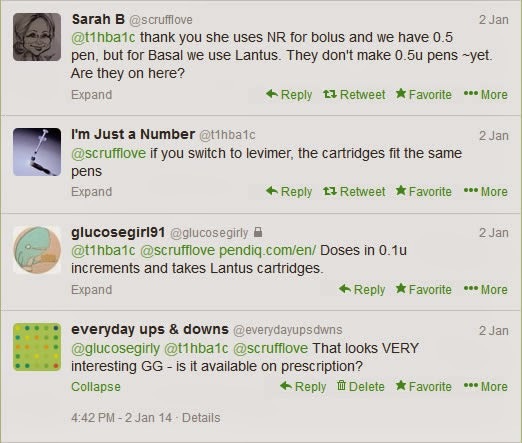 And none of them offered doses in increments smaller than 1 unit. This might be OK if you are on higher doses, but many T1s are quite sensitive to insulin. I'm not quite sure how small children cope, for example. The minimum dose adjustment could well be a significant percentage of the total. The other pen-related problem I had fixed around the same time related to my terrible memory. 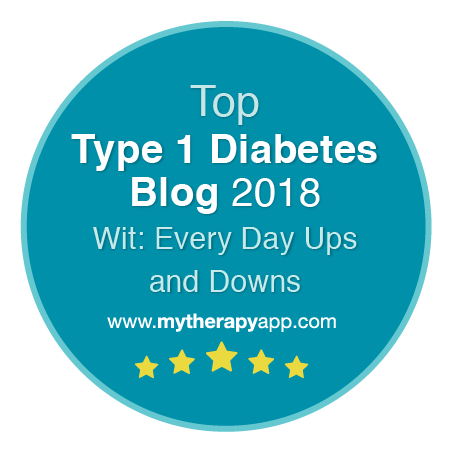 It may be hard to believe it you do not live with diabetes yourself, but after a few thousand injections they can become so automatic that you barely think about them. Sometimes you have absolutely no idea whether you have injected your dose or not. I changed bolus (mealtime) insulin to Humalog to get hold of a pen with a 'dose memory' the Humapen Memoir so that if I was ever unsure I had some means of checking that didn't involve me having to write something down, which I was just as likely to forget to do... Or possibly even to remember to write it down, but then forget the actual injection. See what I mean about my memory? Hopeless! Sadly the Humapen Memoir has since been taken off the market and it looks like its development has been abandoned. So now the only memory-enabled pen available on prescription in the UK is the NovoPen Echo. Thanks to a Twitter conversation I chanced upon earlier this week, I now know there is an alternative. And a very interesting alternative it looks to be too. Pendiq is a new breed of injection device from Germany initially launched in 2011 and relaunched in 2012. Such is the ruthless efficiency of German engineering that this pen boasts not just 0.5u accuracy but increments of 0.1u (from 0.5u upwards). 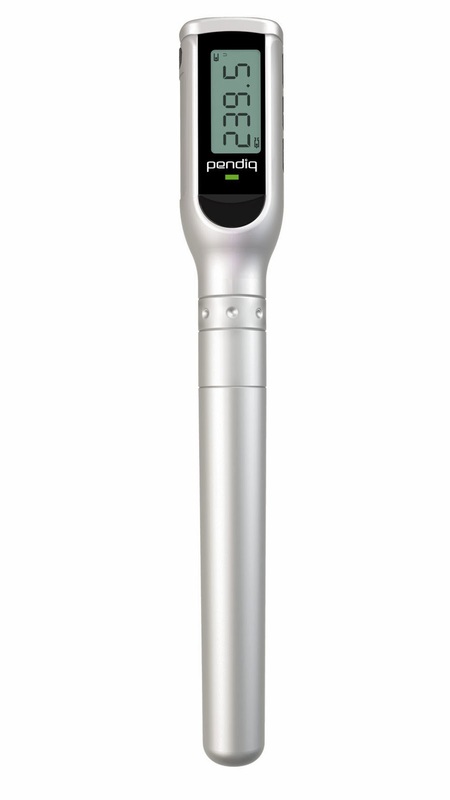 Delivery is unlike any other pen I am aware of - dial up the dose on the display, press the button and a precision motor delivers the insulin at 2/u per second. The pen stores and displays around 2 months worth of injection doses and timings on an LCD screen and the website boasts all sorts of download opportunities and compatibility with logging software such as SiDiary. The battery is rechargeable and the device seems to be compatible with 'standard' insulin pen needles. The Pendiq is compatible with Lilly and Sanofi-Aventis insulins, which means that both Lantus and Humalog doses are now available on MDI in 0.1u dose increments. Heck you can even choose from five funky colours! Unfortunately there is a snag. Isn't there always? It seems the Pendiq is not currently available on prescription in the UK. It looks like you can buy it via the website, but with the shipping/delivery it will set you back almost €185 (around £150). So not cheap... by any means. You would also probably be wise to speak to your DSN/hospital/clinic to get there guidance if you were tempted to spring for one before you part with any cash. There are some diabetes-tech buzzwords that always attract my attention. Thanks to a tweet from Nick Guerin (@Typeaware) I was treated to a triple-whammy this morning. We have come painfully close to a 'non-invasive' BG monitor (or even better CGM) once or twice before, but it is good to see that the search continues. To be honest the breathalyser-style BG monitor (which still uses a single-use 'strip') interests me less than Smart Insulin, which I think is probably my most favouritest 'wildest tech fantasy come true' product of all time ever - see here. "A team at North Carolina State University believes so. Prof Zhen Gu and his team are working on a couple of different systems which may achieve this ideal – effectively creating an artificial replacement to the beta cells in the islets of the pancreas, which would normally release insulin to counter high glucose levels. "Our overall aim is to create 'smart delivery' systems for insulin provision," says Gu. 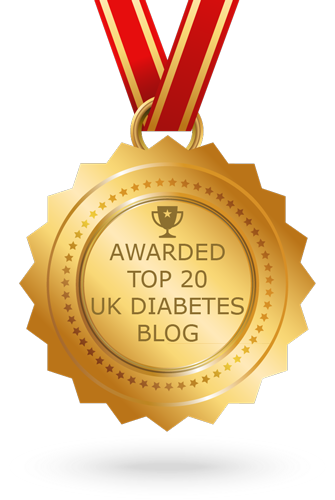 "What I mean by that is that insulin is delivered at the right time, via a safe approach – avoiding too much or not enough dosage – and in a way which requires only small formulations." One of the team's ideas in development is an injectable nanoscale sensory network, announcing earlier this year that such a system maintained normal blood sugar levels for up to 10 days in type 1 diabetic mice. The "nano-network" degrades to release insulin when glucose levels are high and the researchers are currently trying to optimise it to respond as quickly as pancreatic islet cells do naturally in the body, and to make it more biocompatible with human tissue." 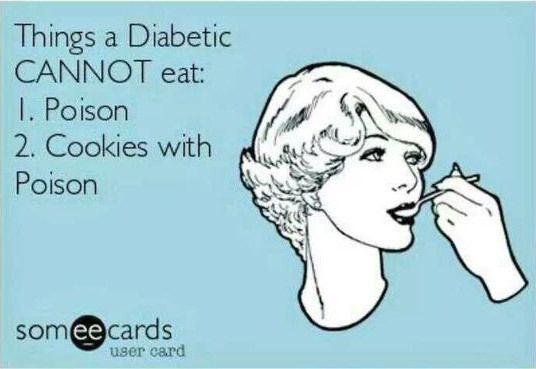 And wouldn't you know it those pesky diabetic mice have beaten us to it again.